How are adults different to children? This project is all about helping adults really hear children’s point of view. The children’s answers were recorded and short 3 to 4 minute sound scapes have been created to reflect the views of children across WA, from Broome to Albany, including Karratha. These sound scapes are going to be exhibited at the 2Hot Festival for Young People at the Red Earth Arts Precinct from 21st June until 1st July 2019. To help bring the sound scapes to life, we are inviting children to design and make “feel boxes” and “peep boxes” to accompany each sound scape. These boxes will help bring the exhibition to life and provide both visual and tactile points of engagement for listeners. Gathering ideas and planning designs of “feel boxes” and “peep boxes”. Designing and beginning to construct “feel boxes” and “peep boxes”. Finalising construction of “feel boxes” and “peep boxes”. These three sessions are held with local artists Michelle Lucev and Megan Wood-Hill in the Red Earth Arts Precinct Rehearsal room. If your child/children are able to attend, please register via email boxoffice@redearthartsprecinct.com.au or call into the Box Office from 9am-5pm weekdays. The Christmas period can be filled with love and laughter but, can also be incredibly difficult for others. Unfortunately, this past holiday season saw six incredible locals take their own lives. As a football club we are all passionate about our community and the well being of our people within. We are igniting the awareness this April 13th by hosting a 7km course around Dampier starting at sharks oval running alongside the coastline finishing back at the oval. We invite everyone to be apart of this we are organising fundraising opportunities, activities for the kids and food to be available at the Sharks Oval. As well as raising awareness we are raising funds for two amazing foundations in Karratha The Men’s Shed and also The Karratha Womens Place. Join our journey and please remember every donation counts! The Dampier Sharks are extremely excited to be able to bring everyone together, raise funds and spark those extremely important conversations. More information regarding the track and start time will be released shortly. Hosted by Dampier Community Association (DCA), the Dampier Beachside Markets are held monthly at the picturesque Hampton Oval on The Esplanade, Dampier. Bringing together home-based and local businesses, great food and entertainment – there is something for everyone at the Dampier Beachside Markets. Each market generally attracts over 40 stallholders – showcasing everything a wide array of products including gourmet food, children’s clothing and toys, eco-friendly cleaning products, paddle boards, dive and fishing gear, gifts and jewelry, and much, much more. The Markets are made possible through sponsorship from Major Partner the City of Karratha with support from Pilbara News. DCA contracts local, events company Wrapped Creations to manage the markets and coordinate all stallholders. 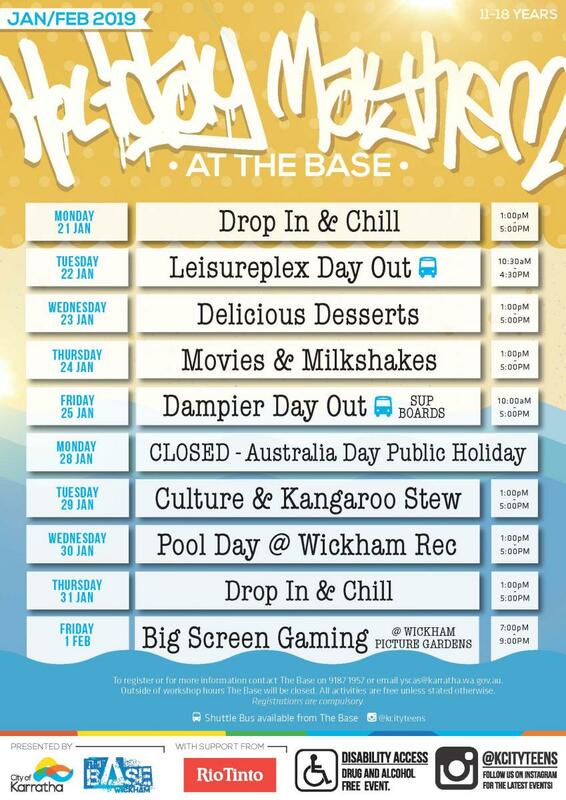 For registrations please visit https://www.dampier.org.au/beachsidemarkets/. The first project to see the light of day in 2019 will be the aptly titled ‘AVIARY TAKES’, a collection of older, existing back catalogue songs and a smattering of new tracks including a couple of out-of-the-blue covers and fresh tunes stripped back and all recorded in ‘one vocal take’ at The Aviary Studio’s in inner city Melbourne. The AVIARY TAKES collection will be released early in 2019 and to celebrate its release, Sultan will head back out on the road armed with a guitar, a keyboard and a fresh batch of anecdotes and bad ‘dad’ jokes! The tour run sees Dan traverse the country in regional areas that he is both familiar and not so familiar with. Says Sultan; “I’m really looking forward to hitting the regional road with ‘The Aviary Takes’ tour. It’ll be good to make up for the shows I had to cancel earlier this year. ‘The Aviary Takes’ are a group of songs I recorded recently and they include old, current, new tracks with a couple of surprise covers thrown in. It’ll be great to see all of your lovely faces at the shows”. 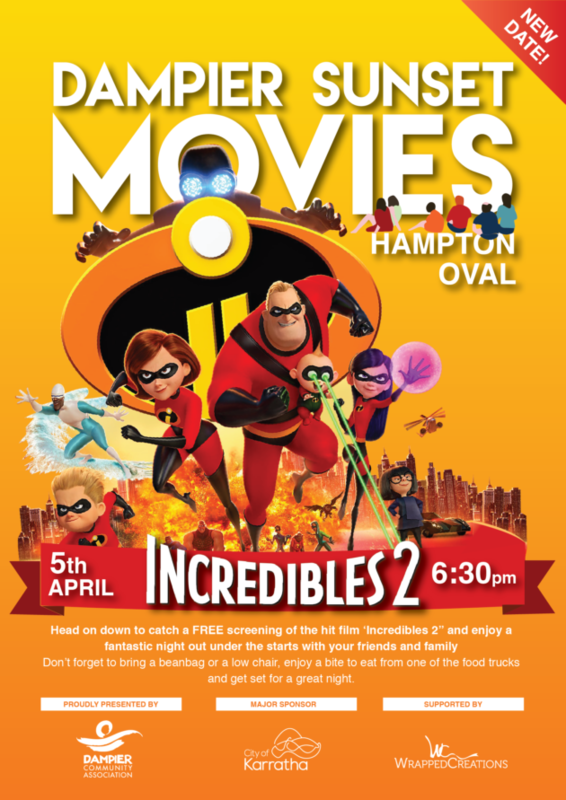 Dampier Community Association is back in 2019 with the first Dampier Sunset Movie Night screening Incredibles 2 at Hampton Oval on 5 April. Come along with your picnic for a movie night under the stars. Do you want to learn about putting on performances in the Red Earth Arts Precinct? Are you interested in behind the scenes work? Do you know how to analyse a script so you can work with or be a designer? Do you know how to be a stage manager? How do you cost the show you want to put on? All these questions and more will be answered! No matter how inexperienced you are or even if you have done all this before, come and join us for some fun and interesting stuff! Getting it all together – how to work with professional staff to get the most out of your time in the venue. Stage management – how to run a stage effectively. How to write cues, and how to call a show. Curtains up! Now the show is running, what happens next? In 2016 Oxana was one of the top six finalists at the Sydney International Piano Competition and also won the prize for the best Piano Quintet. A keen chamber musician, Oxana has collaborated with musicians such as the Kopelman Quartet, Brodsky Quartet, Ray Chen, Narek Hakhnazaryan, Alena Baeva, Christoph Croisé and Isabel Villanueva. In 2014, together with the Latvian violinist Jana Ozolina, Oxana received the Second Prize at the Sion International Duo Competition. The two artists starred in the movie “The Looser Takes It All” by the famous duo of musicians and comedians Igudesman & Joo. Oxana made her debut recording with Delphian Records which was released in 2011, and included works by Shostakovich, Mozart, Liszt, and Ravel. Konga is a low complexity; high intensity dance based fierce workout set to awesome music. Hybrid fitness that is never boring, always fun yet challenging no matter what your level is…coordinated, fit or not! Boxing, hip hop, jazz, Bollywood, club cardio, latino, ballet, pilates and toning, we smash it all! 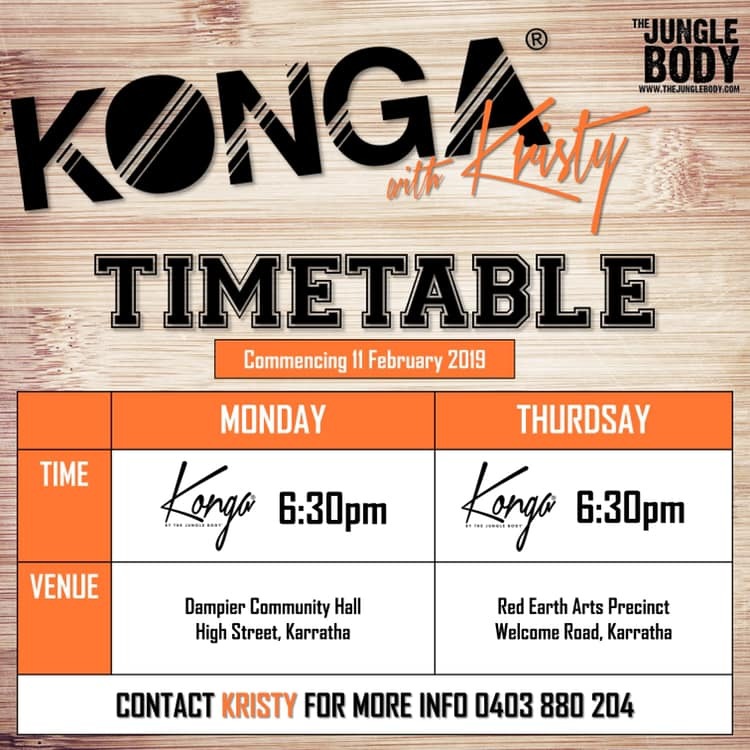 Konga is a workout like no other… working up a sweat (burning up to 800 calories in just one hour) has never been so damn addictive. $160 10 Class Passes available! For further information please contact Kristy on 0403 880 204 or via email kristy30@me.com. If you are a current or aspiring performing artist aged 16+ then come join our fun and creative 6 week skills development program. Brought to you by "The Creative Collective" (A Pitter Pat Productions & IF Foundations Joint Venture). Led by performing arts professionals from the IF foundation & Pitter Pat Productions, this program covers the essential principles & techniques of improv, gradually building on participants skills with a performance opportunity at the end. Ideal for developing your skills in performance & writing, building confidence, expanding creativity and having fun in a safe, supportive environment. This program involves a once weekly workshop, every Friday (6.30 to 8pm) for 6 weeks. At the end of the program there will be a non-compulsory performance opportunity (details TBC). Cost is $10 per workshop or $48 for all 6 (prepaid). Participants can book in casually and attend 1 or all sessions. They are not required to attend every workshop, however this is encouraged to get the most out of the program. Please contact info@pitterpatproductions.org.au for more information. Meet at Karratha Leisureplex Basketball court #2. Volunteers are asked to bring their own water (min.5L per person), sunscreen, wide brim hat gloves and closed boots or shoes. Areas to be cleaned: Back Beach to Nickol along Bayview Rd. All volunteers are invited to enjoy a free swim at the Karratha Leisureplex pool after the event debriefing. Thursdays at 6.30pm, commencing Feb 14th 2019. No need to book, register at the door on the day. 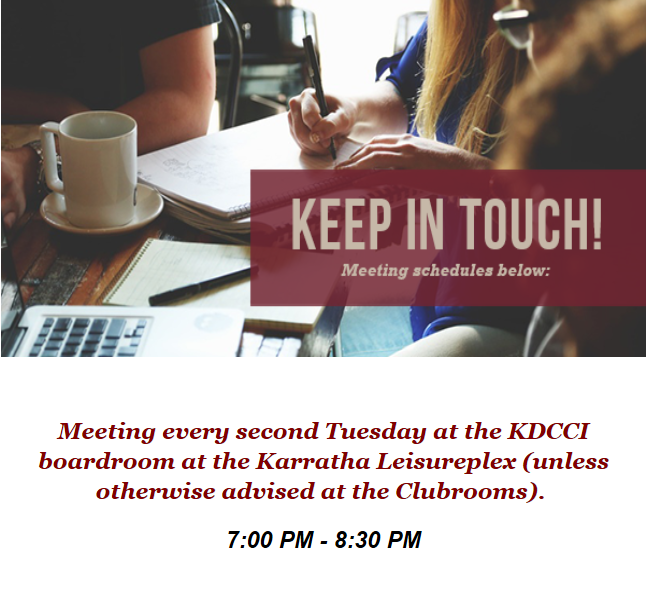 Meeting every second Tuesday at the KDCCI boardroom at the Karratha Leisureplex (unless otherwise advised at the Clubrooms). To register or for more information contact The Base on 9187 1957 or email yscas@karratha.wa.gov.au. We are jumping in boots and all for this first workshop in a series of 2 on Character Development! We will use the Character descriptions as inspiration to create our own characters and develop a short scene. Cost is free but chocolates are welcome! 😉 Hope you can make it!